The primary scientific objective is to provide time/height ozone measurements from near the surface to the top of the troposphere to describe in high-fidelity their spatio-temporal distribution. These high-fidelity measurements will provide the GEO-CAPE science team with accurate representations of the PBL and FT ozone structure as proxies for the high time resolved observations from a geosynchronous satellite. With these observations of the detailed ozone structure, the GEO CAPE science team will be able to study the character of lower-atmospheric ozone and also assess the accuracy and vertical resolution with which a geosynchronous instrument could retrieve the observed laminar ozone structures. A second objective is to identify a brassboard ozone lidar instrument that would be suitable to populate a network to address the needs of NASA/EPA/NOAA air-quality scientists and managers who increasingly express a desire for ozone profiles. The third focus of the use of these lidar data resides in basic scientific research into the processes creating and destroying the ubiquitously observed ozone laminae. To achieve the first objective (measurements in the near term), we propose engineering changes to existing ozone lidars to make them suitable to our objectives. These engineering changes are not technology development and incur minimal risk. We propose to achieve the second objective (network brassboard design) through working-group study of current and potential instrument designs. If the recommended solution requires technology development, we would propose to coordinate that funding through ESTO/IIP/SBIR conduits. However, if that recommended solution does not require technology development, we would explore a commercial avenue for production of the network instrument. We would achieve the third objective (basic research) by engaging the research community with the data obtained by the near-term lidars. Provide high spatio-temporal observations of PBL and FT ozone for use by the GEO-CAPE science team to study the character of the atmospheric structure that GEO-CAPE will observe and assess the fidelity with which a geo instrument can measure that structure. Discover new structures and processes at the PBL/FT boundary, especially in the diurnal variation of that interface. Foster use of these high-resolution ozone observations to improve the processes in air-quality forecast and diagnostic models. Exploit synergy with DISCOVER AQ, thermodynamic profilers, MOZAIC/IAGOS, regulatory surface monitors, and other networks. Improve our understanding of the relationship between ozone and aerosols aloft and surface ozone and PM values. [Fairlie et al., 2009] [Thompson, et al., 2008] [Morris, et al., 2010]. Advance our understanding of processes controlling regional background atmospheric composition (including STE and long range transport) and their effect on surface air quality to prepare for the GEO-CAPE era. The Rocket-city O3 Quality Evaluation in the Troposphere (RO3QET) lidar, located at ~206 m ASL and (34.73N, 86.65W), was developed jointly by University of Alabama in Huntsville (UAH) and NASA’s GSFC. This system retrieves ozone between 0.1 and ~12 km AGL with a typical integration time of 10 min and vertical resolution of 150 m in the PBL to ~750 m at upper troposphere. The lidar consists of three receivers with 2.5, 10, and 40-cm diameter primary mirrors. Multiple receiver systems can extend the dynamic range of the counting system and, therefore, increase the measurable range. Validation of the lidar measurements using ozonesondes has shown that the uncertainties for 10-min retrievals are less than 10% at the near range and less than 20% at the far range. Previously, the laser transmitter consisted of two Nd:YAG pumped dye lasers operating at 285 and 291 nm. After 14 May 2013, the dye laser transmitter was upgraded to a Raman-shifted laser transmitter at 289 and 299 nm for its easy installation, robustness, and good conversion efficiency. Correspondingly, the previous 285-291-nm band-pass solar filter was replaced by a 300-nm short-pass filter (for all receivers) accommodating the laser wavelength change. The integrated solar radiation up to 300 nm is much higher than that up to 291 nm so that the highest measurable altitude during daytime was only ~5 km. On 26 August 2014, the Hamamatsu PMTs replaced the EMI PMTs for the 40-cm receiver so that all the PMTs for the lidar were Hamamatsu (either R7400U or R9880U). On 22 October 2014, the narrow band filters at 289 and 299 nm replaced the 300-nm short-pass filter to reduce the daytime solar background to extend the highest daytime measurable altitude to ~12 km. The primary objective of our ozone lidar observation is to provide accurate tropospheric ozone structure to evaluate photochemical models and improve the future satellite retrievals especially in the boundary layer. The RO3QET data and its more information are also available at http://nsstc.uah.edu/atmchem/lidar/DIAL_data.html. Kuang, S., M. J. Newchurch, J. Burris, L. Wang, K. Knupp, and G. Huang (2012), Stratosphere-to-troposphere transport revealed by ground-based lidar and ozonesonde at a midlatitude site, J. Geophys. Res., 117, D18305, doi:10.1029/2012JD017695. Kuang, S., M. J. Newchurch, J. Burris, and X. Liu (2013), Ground-based lidar for atmospheric boundary layer ozone measurements, Appl. Opt., 52, 3557-3566, http://dx.doi.org/10.1364/AO.52.003557 . 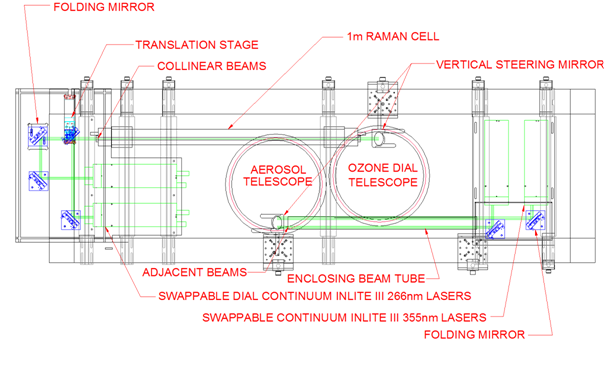 A compact differential absorption lidar (DIAL) system was developed through the Small Business Innovation Research (SBIR) program to provide ozone, aerosol and cloud atmospheric profile measurements. The laser transmitter consist of a commercial 1-kHz diode pumped Q-switched Nd:YLF laser (Coherent Evolution 30 TEM00 laser) pumping a Ce:LiCAF tunable UV laser with all the associated power and lidar control support units on a single system rack. 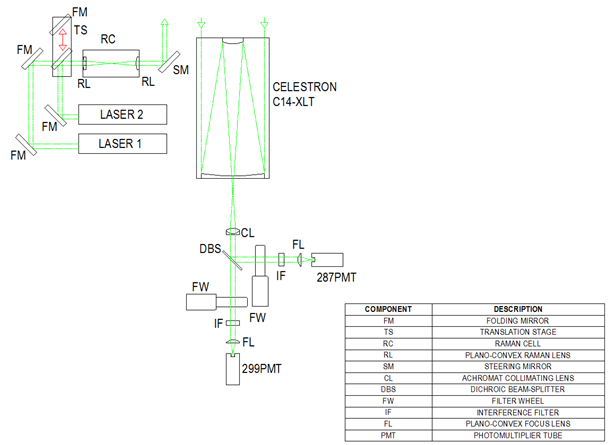 An optical schematic of the laser transmitter is shown in figure 1. 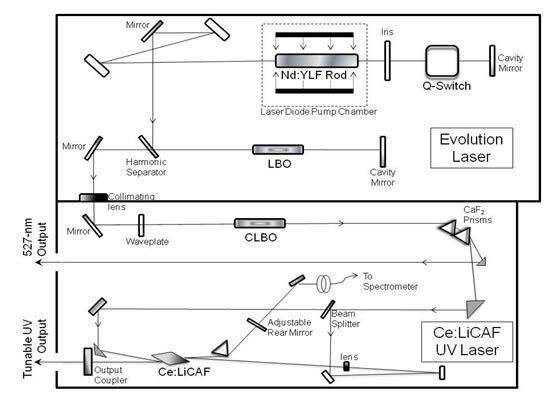 Figure 1: Optical schematic of the laser transmitter module which includes a Nd:YLF laser pump and a Ce:LiCAF tunable UV laser. The custom-designed Ce:LiCAF tunable UV laser has a wavelength range of 280 to 298-nm that is selectable between two wavelengths. Following harmonic conversion of the 527-nm pump beam into the 263-nm fourth harmonic, a dispersive prism is used to separate the 527-nm beam from the 263-nm pump beam. The 527-nm visible beam is transmitted into the atmosphere for aerosol measurements. In order to produce different UV wavelengths, a high-reflectivity rear cavity mirror is mounted on a servo controlled galvanometer motor to allow rapid tuning between the two output ozone wavelengths. The lidar receiver system consists of a receiver telescope with a 40-cm diameter parabolic mirror. A fiber optic cable transmits the received signal from the telescope to the receiver box, which house the detectors shown in figure 2. 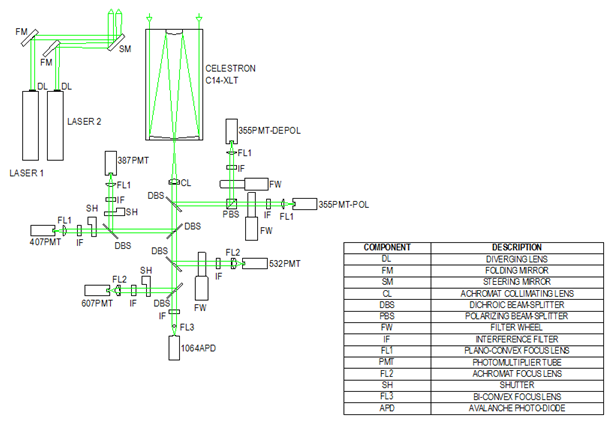 Figure 2: Optical schematic of the receiver box. The lidar control and support units are located on a system rack. A computer handles lidar control, data acquisition, and analysis. The lidar control software is a National Instruments CVI/Lab-windows based package, which allows graphical user interface for easy operation of menu driven controls to configure the lidar. The software includes a program for real time display of the ozone and aerosol signals and display of the ozone concentration calculated from the lidar atmospheric measurements. A basic diagram of the ground based atmospheric transmission setup is shown in figure 3. To obtain an ozone atmospheric measurement, the transmitter sends ~ 80-microJ (1-kHz) laser pulses into the atmosphere at alternating 282-nm on-line and 293-nm off-line wavelengths (500-Hz each). The 527-nm green laser output can be transmitted giving a return from atmospheric aerosols and clouds. Ozone and aerosol atmospheric data is usually stored at 20-sec accumulations and curtain plots are generated at 90-m vertical resolution and 10 min. average horizontal resolution. A very near field telescope allows ozone measurements from about 200- to 500-m and is spliced into the ozone curtain profile. 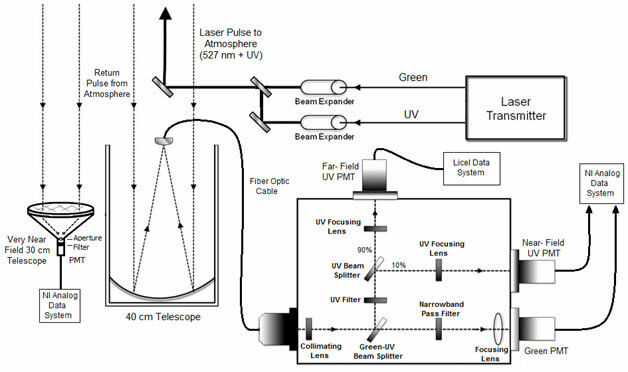 Figure 3: Lidar setup for atmospheric ozone measurements. The lidar system is mounted in an environmentally controlled trailer to enable mobility and can be easily towed with a truck to remote sites. The objective is to make the system mobile such that it can be setup at remote sites in support of air quality field campaigns. Figure 4 shows the lidar trailer with a collocated ozonesonde launch which was used to validate the lidar returns. Figure 4. The LMOL trailer with collocated ozonesonde launch. 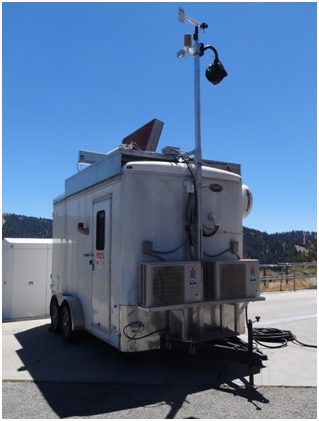 The lidar beam and telescope are located at the open door on trailer roof. A typical ozone curtain profile is shown in Figure 5 for May 4, 2014. There were 6 ozonesondes launched during lidar operation and ozone on the ground was also recorded. The ozone range can be extended to about 6-km at night but during the day the signal to noise decreases as shown in the figure at 12:07 PM. Figure 5. 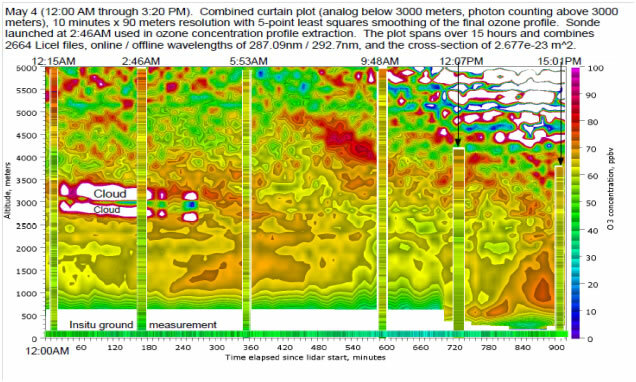 Ozone curtain plot from Mat 4, 2014 with ozonesonde results at NASA Langley Research Center. 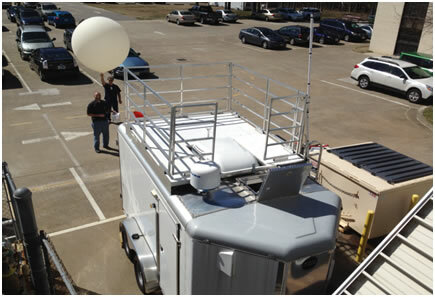 A 2B Technology in-situ ozone monitor was deployed on the trailer for ozone concentrations at 5.5-m above ground. Figure 6. 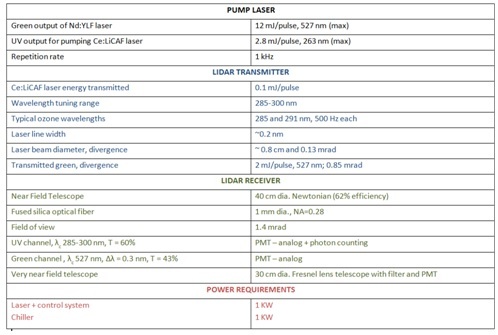 Table of lidar characteristics. The ground based GSFC TROPOZ DIAL has been routinely taking measurements in the Baltimore-Washington D.C. region (Greenbelt, MD 38.99° N, 76.84° W, 57 meters ASL) since Fall of 2013, which is described in depth in Sullivan et al. (2014). The TROPOZ has been designed and installed in a 13 m transportable trailer. Since the initial installation, the TROPOZ has been deployed for several science investigations, including NASA’s 2014 DISCOVER AQ campaign. The transmitter for the system is a Spectra Physics Quanta-Ray pulsed Nd:YAG laser which has two independent parallel laser cavities that have been optimized for the conversion of the fundamental to the fourth harmonic at a wavelength of 266 nm at a repetition rate of 50 Hz. The beams pass through converging lenses, which focus each beam waist near the center of a 1.8 m long Raman tube filled with hydrogen or deuterium. Helium was introduced in the Raman tube in order to yield the highest possible Raman conversion of pump photons into 1st Stokes shift photons. The TROPOZ final pressure combination to generate 289 nm was 21 bar D2/ 28 bar He and 14 bar H2/ 42 bar He to generate 299 nm. The typical transmitted energies for the TROPOZ measurements are 12 (299 nm) and 16 (289 nm) mJ per pulse. 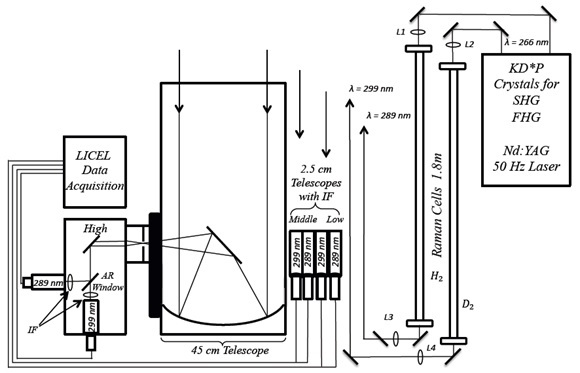 The receiver for the TROPOZ is a large 45 cm diameter Newtonian telescope for detecting 289/299 nm at higher altitudes in the free troposphere and four smaller 2.5 cm refracting telescopes to obtain signal near the surface for 289/299 nm. For the 45 cm telescope, the lidar return is focused at a field stop to produce a 1.0 mrad field of view (FOV). After the field stop, all ambient and laser light is reflected or transmitted using optical elements, such as beam splitters and interference filters, to ensure each photomultiplier tube (PMT) is only receiving the proper spectral signal. The 2.5 cm telescopes have a much wider FOV, 10.0 mrad, for the measurement of near field signals. In each of the channels, narrow band (<1.2 nm FWHM) interference filters are implemented to decrease the amount of ambient solar light. This improves the signal-to-noise ratio (SNR) in order to achieve ozone retrievals to upwards of 12 km AGL during daytime hours and 14 km AGL during nighttime hours. Neutral density filters are placed in front of the detectors to reduce the large signal strengths that can cause non linear saturation effects in the detector system. Once these saturation effects are eliminated, the higher signal (near field) channels can be joined to the lower signal (far field) channels to increase the dynamic range of the overall lidar system. To further help prevention of saturation effects associated with the detector photocathode, the individual PMTs have been constructed with electronic gating capabilities. The electronic gates are set at specific altitudes in order to restrict known saturated signals from ever making it downstream into the data acquisition system. Individual photons are then counted by a transient recorder (LICEL TR 20 - 80, GmbH, Germany) at a maximum counting rate of 300 MHz. The data acquisition process is controlled by LabView software and a real time display of ozone concentrations is available during observations. Figure 1: The hardware design of the GSFC TROPOZ DIAL depicting the transmitter, Raman cells, detectors, and data acquisition system. Figure 2: The GSFC TROPOZ DIAL was deployed to Ft. Collins, CO during the 2014 DISCOVER AQ campaign. The NASA P3B is shown spiraling over the site while the TROPOZ is taking measurements. Ozonesondes were also launched at the site to help validated the aircraft and lidar profiles. Photo Credit: L. Twigg. J. T. Sullivan, T. J. McGee, T. Leblanc, G. K. Sumnicht, and L. W. Twigg. Optimization of the GSFC TROPOZ DIAL retrieval using synthetic lidar returns and ozonesondes - Part 1: algorithm validation. Atmospheric Measurement Techniques Discussions, 2015 (Submitted). J. T. Sullivan, T. J. McGee, R.J. De Young, G. K. Sumnicht, L. W. Twigg, D. Pliutau, W. Carrion, and T. Knepp. 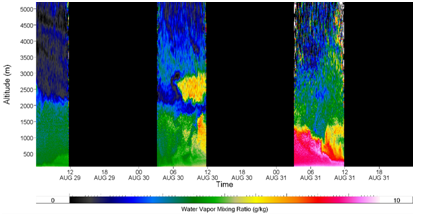 Results from the NASA GSFC and LaRC ozone lidar intercomparison: New mobile tools for atmospheric research. Journal of Atmospheric and Oceanic Technology, 2014 (Submitted). J. T. Sullivan, T. J. McGee, G. K. Sumnicht, L. W. Twigg, and R. M. Hoff. A mobile differential absorption lidar to measure sub-hourly fluctuation of tropospheric ozone profiles in the Baltimore - Washington, D.C. region. Atmospheric Measurement Techniques, 7(10):3529–3548, 2014. The DIAL wavelengths are generated by stimulated Raman shifting of the Nd:YAG fourth harmonic (266 nm) in D2 (289 nm) and H2 (299 nm). The laser is a 30-Hz dual-beam system, and the two output wavelengths are generated and transmitted simultaneously. The laser produces ~40 mJ of energy in each of the 289 and 299 nm beam. To reduce the laser divergence, as is required because of the small field of view (FOV) of the telescope, refractive beam expander telescopes with a magnification of 5 are used after the Raman cells. From considerations of simplicity and cost it was decided to use a Newtonian configuration. The mirror was made by Intermountain Optics (Murray, Utah) and is 91 cm (36 in) in diameter with a focal length of 254 cm (100 in), i.e., f/3. Specifications of the mirror are given in Table 1. Because the telescope is required to look vertically upwards only, the mirror is supported on its back surface by a stiff, flat optical breadboard. A thin layer of air bubbles between the rear surface of the mirror and the breadboard accommodates any small inconsistencies in the flatness of the back surface. The telescope structures were designed and built at TMF. The focal-plane optics are supported by a hexapod structure. The hexapod rods are made from stainless steel to reduce thermal-expansion effects. This structure is extremely rigid even with relatively small-diameter (25-mm) rods. A custom dual-fiber arrangement (CeramOptec) is mounted at the telescope focus. In this arrangement the fiber jacket is stripped away at the ends so that the fibers can essentially touch. The fibers are then held in place in a special stainless-steel ferrule (6 mm diameter (50 mm long). The fiber core diameters are 1.5 mm and are used as the effective field stops at the telescope focus. Each fiber views a different region in the atmosphere, but, because the FOV is only 600 mrad, these regions are small and close together, e.g., at 10 km each region is 6 m in diameter and separated by essentially the same amount. This arrangement is then used as the primary step to separate the two DIAL wavelengths. The transmitted beams are each aligned to one particular fiber, i.e., centered in the FOV. Because the laser divergence is much less than the FOV, the beams are well separated in the atmosphere. Returns from close range are collected by two separate small telescopes, of 50-mm aperture, that focus the laser backscatter onto 400 mm-diameter fibers. Each of these small telescopes is aligned independently to one of the output laser beams. The chopper wheel rotates at 6000 rpm, and the radii to the fiber positions are 160 mm for the near-range fibers and 100 mm for the far-range fibers. The near- and far-range chopping positions are staggered such that the far range opens up at an approximately 5-km-higher altitude. Adjustment is provided so that this offset can be both varied and set precisely. At the near-range fiber positions the blade speed is 100 ms-1, and therefore the time to move across the 400-mm fiber is 4 ms, i.e., <1 km. This fast transition is required so that we can get the near channels open as soon as possible while still blocking the returns from the boundary layer and scattered laser light within the laboratory. A detector package is attached to the rear of the chopper housing. This package incorporates a narrowband mirror that reflects the UV light at the laser wavelengths and transmits everything else; this helps to reduce background noise from skylight. This is followed by a collimating lens and a narrowband interference filter. The light is then refocused onto the photocathode (8 mm diameter) of a photomultiplier module (Hamamatsu H5783P-06). Signals from the photomultipliers are input directly to a four-channel photon-counting system (Licel). The minimum dwell time of the Licel multichannel scaler is 50 ns, corresponding to a range resolution of ~7.5 m; typically eight or ten channels have been binned together internally for a maximum resolution of 60 or 75 m since 1999 and until January 2012. For the purpose of near-ground measurements, the binning process was abandoned and the raw 7.5-m range resolution has now been used since February 2012. The upper altitude limit is set by the extinction of the laser radiation by the increasing concentration of ozone above 20 km; the 289-nm beam is completely extinguished by the ozone layer. The typical integration time for our TMF profiles is ~2 h; however, much shorter times can be used. The low channels signals are usable from ~3.5 km upwards and the high channels from ~8-10 km upwards. A second DIAL system, operating at 308 and 355 nm, for ozone measurements in the stratosphere, ~15-50 km altitude, has also been in long-term operation at JPL TMF. The combination of the 299-nm signal from the troposphere system with the 355-nm signal from the stratosphere lidar provides a high-quality profile over the altitude region from ~15 to 28 km. intermittently since spring 2012 to measure ozone profiles primarily during high ozone events associated with stratosphere troposphere transport (STT) events. The TOPAZ lidar transmitter is based on a Ce:LiCAF laser that is pumped by a quadrupled Nd:YLF laser. The lidar produces 100-ns light pulses at a 1 kHz repetition rate and can be tuned from approximately 283 nm to 310 nm. TOPAZ is configured for three-wavelength operation, and the wavelengths can be changed by the user to optimize the performance for different atmospheric ozone and aerosol loadings. The TOPAZ transmit wavelength is sequentially tuned from pulse to pulse, i.e. the same set of three wavelengths is emitted at a repetition rate of 333 Hz. Three-wavelength capability permits use of the dual-DIAL technique, which minimizes the interference of differential aerosol effects on the ozone retrieval. Typical average UV output power is 50 - 80 mW. The transmit beam is sent through a 5x beam expander resulting in a 5-mm wide beam with a 0.5 mrad full-angle beam divergence. The expanded beam is reflected off a mirror located on-axis of, and directly behind the secondary mirror of the receiver telescope. The backscattered light is collected with an f/2 50-cm diameter Newtonian telescope and then split at a 1:9 ratio into near- and far-field detection channels. The field of view (FOV) of the near- and far-field channels is controlled by different-size apertures resulting in full overlap (between the FOV and the transmitted laser beam) at distances of ~ 300 m and ~ 800 m, respectively. Both channels use gated Hamamatsu R2076 photomultiplier tubes (PMTs) operated in analog mode. The PMT output signals are amplified by computer-controlled variable gain amplifiers that allow adjustment of the gain settings for the different pulses and wavelengths. Subsequently, the near- and far-field signals are digitized at a 100 MHz sampling rate using two 14-bit digitizers based on custom field programmable gate arrays. Before being stored, the data are averaged to a 6-m range resolution and a 5-Hz data rate. 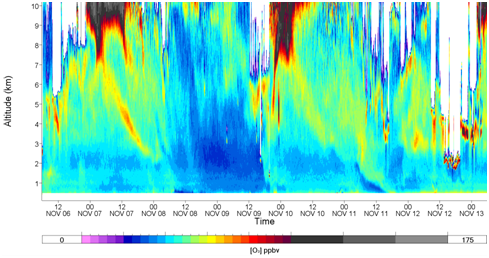 Ozone and aerosol backscatter profiles are typically retrieved at range resolutions of 90 m and 6 m, respectively. The time resolution varies from 10 s to several minutes depending on the atmospheric conditions and the desired precision of the data. More details about the technical aspects of the TOPAZ lidar and the ozone and aerosol retrieval procedure can be found in Alvarez et al. (2011). The conversion of TOPAZ from a nadir-pointing airborne system to an up-looking, scanning instrument primarily entailed inverting the telescope and re-routing the transmit beam. These changes are reversible so that TOPAZ can be flown in an aircraft in the future if needed. The modified TOPAZ lidar was moved into a truck that was outfitted with a custom-built, roof-mounted two-axis scanner (Fig. 1). The scanner permits pointing the laser beam at several shallow elevation angles at a fixed, but changeable azimuth angle. Zenith operation is achieved by moving the scanner mirror out of the laser beam path. Operation of the ground-based TOPAZ typically consists of scans at 2, 10, and 90 degrees elevation angle that are repeated approximately every 5 minutes. The dwell time at each angle is 75 s. The ozone and aerosol backscatter profiles at these three angles are spliced together to create composite vertical profiles extending from 15 m to about 3 km AGL (Fig. 2). The effective vertical resolution of the composite ozone profiles increases with altitude from 3 to 90 m. Horizontal measurements are performed occasionally to study the variability of ozone and aerosols near the surface. The new, truck mounted version of the TOPAZ lidar is described in more detail in Alvarez et al. (2012). Figure 2: Lidar ozone profiles at elevations angles of 2°, 10°, and 90°, projected vertically and blended together. The three plots show the same composite profile, expanded form left to right to show the detail in the lower angle measurements close to the surface. Alvarez, R. J., Senff, C. J., A. M. Weickmann, S. P. Sandberg, A. O. Langford, R. D. Marchbanks, W. A. Brewer, and R. M. Hardesty, 2012, Reconfiguration of the NOAA TOPAZ Lidar for Ground-based Measurement of Ozone and Aerosol Backscatter, Proceedings of the 26th International Laser Radar Conference, Porto Heli, Greece, 25-29 June 2012, pp. 249 – 252. Langford, A. O., C. J. Senff, R. J. Alvarez II, R. M. Banta, and R. M. Hardesty, 2010: Long-range transport of ozone from the Los Angeles Basin: A case study, Geophys. Res. Lett., 37, L06807, doi:10.1029/2010GL042507. Langford A. O., C. J. Senff, R. J. Alvarez II, R. M. Banta, R. M. Hardesty, D. D. Parrish, T. B. Ryerson, 2011, Comparison between the TOPAZ airborne ozone lidar and in situ measurements during TexAQS 2006, J. Atmos. Oceanic Technol., doi: 10.1175/JTECH-D-10-05043.1. Senff, C. J., R. J. Alvarez, II, R. M. Hardesty, R. M. Banta, and A. O. Langford, 2010, Airborne lidar measurements of ozone flux downwind of Houston and Dallas, J. Geophys. Res., 115, D20307, doi:10.1029/2009JD013689. Environment and Climate Change Canada (ECCC) has recently developed a fully autonomous, mobile LIDAR system called AMOLITE (Autonomous Mobile Ozone LIDAR Instrument for Tropospheric Experiments) to simultaneously measure the vertical profile of tropospheric ozone, aerosol and water vapor (night time only) from near ground to altitudes reaching ten to fifteen kilometers (Strawbridge, 2018). The current system described here builds upon the successes of the autonomous aerosol LIDARS built over the past decade by ECCC (Strawbridge, 2013). This current system uses a dual laser (for redundancy), dual LIDAR design housed in a single climate-controlled trailer. A picture of AMOLITE, operating in full autonomous mode, deployed on a field experiment is shown below. Ozone profiles are measured by the DIfferential Absorption LIDAR (DIAL) technique using a single 1 m Raman cell filled with CO2. The DIAL wavelengths of 287 nm and 299 nm are generated as the second and third Stokes lines resulting from stimulated Raman scattering of the cell pumped using the fourth harmonic of a Nd:YAG laser (266nm). The aerosol LIDAR transmits three wavelengths simultaneously (355 nm, 532 nm and 1064 nm) employing a detector designed to measure the three backscatter channels, two nitrogen Raman channels (387 nm and 607 nm), and one cross-polarization channel at 355 nm. In addition, we have added a water vapor channel arising from the Raman-shifted 355nm output (407nm) to provide nighttime water vapor profiles. 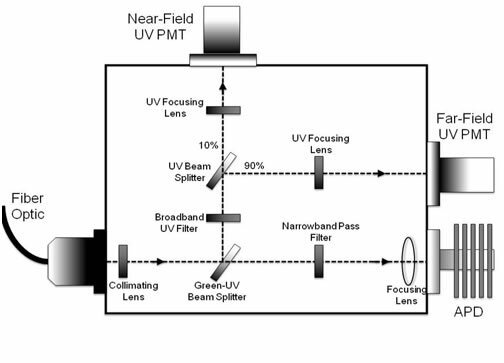 The optical bench layout and details of the transmitter and receiver optics are shown below. Strawbridge, K. B.: Developing a portable, autonomous aerosol backscatter lidar for network or remote operations, Atmos. Meas. Tech., 6, 801-816, https://doi.org/10.5194/amt-6-801-2013, 2013. 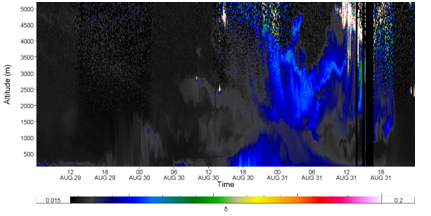 Strawbridge, K. B., Travis, M. S., Firanski, B. J., Brook, J. R., Staebler, R., and Leblanc, T.: A fully autonomous ozone, aerosol and night time water vapor LIDAR: a synergistic approach to profiling the atmosphere in the Canadian oil sands region, Atmos. Meas. Tech. Discuss., https://doi.org/10.5194/amt-2018-108, in review, 2018.